Interest Rates: Does Hiking Damage Your Wealth? Are financial markets wrong to be so obsessed with rate changes? Until late last year, no American or British investment professional in their 20s – and only very few in their early 30s – had experienced a rise in their domestic interest rate during their working lives. That all changed on December 16, 2015 as the US Federal Reserve finally increased rates and reversed a trend that had dominated financial markets for almost a decade. And yet, although the rate hike was widely anticipated in magnitude and timing, markets, which had previously proven surprisingly resilient, saw a period of sharp declines and volatility in subsequent weeks. Given that market participants had not dealt with rising rates in these economies for this considerable amount of time, the level of investor uncertainty was perhaps unsurprising. However, is the financial market's fixation on interest rate movements historically warranted by their impact on equity and bond returns, and if so, how do the various asset classes perform through rising and easing cycles? And what lessons on monetary policy can be drawn from looking back at the history of recoveries from the three great crises of capitalism during the1890s, 1930s, and since 2008–09? New research from the Credit Suisse Research Institute and Elroy Dimson, Paul Marsh and Mike Staunton from the London Business School looks at data from 21 countries, dating back to the year 1900, to answer these questions as together they present the Global Investment Returns Yearbook 2016. Stefano Natella, Head of Global Market'sMarkets Research at Credit Suisse, said: "The aim of the Investment Returns Yearbook is always to provide a unique historical lens with which to view the investment issues of the day. With a debate over the direction of the interest rate cycle being front and center at present, the content of this year's Yearbook is again helping to frame thinking around a topic at the top of the agenda for investors." 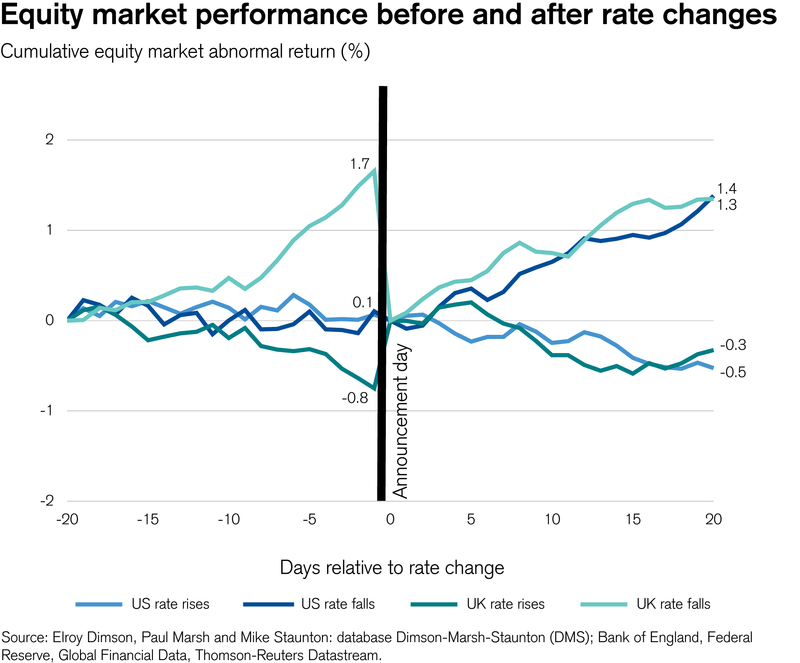 Based on more than a century of evidence on US interest rates, and 85 years for the UK, it is clear that interest rate announcement-day impacts on financial markets are typically small, especially when policy moves are well-signalled. Nevertheless, rate rises are on average bad news for equity and bond investors, as the report's authors found that real equity and bond returns tended to be higher in the year following rate falls than in the year after rate rises. This can also run the other way, as asset prices and volatility themselves influence rate changes. There is a tendency for rising stock prices to drive short-term interest rates in the same direction, while sharply falling prices can provoke monetary easing. This effect may partly be driven by policymakers' concern with wealth effects. There is also evidence that, when volatility is high, central banks tend to defer rate hikes. The report found marked and statistically significant differences in stock and bond returns between periods following interest rate rises and periods after rate cuts. In the USA, annualized real equity returns were just 2.53 percent during tightening cycles and 109.3 percent during loosening periods. Real bond returns were 0.23 percent in hiking cycles and 3.76 percent during periods of easing. Given this, and the general trend of rising interest rates, as evidenced by the Federal Reserve's raise in December 2015, investors should expect relatively lower yields on bonds for the foreseeable future. Bond yields in the major developed countries have only been as low as they are now on two occasions, both times in the aftermath of major financial crises. Now that the Federal Reserve has started raising policy rates, it is worth revisiting the parallels and contrasts betweenre-examining the three great crises of capitalism, namely the 1890s, 1930s, and the period from 2008-09 to see what light they can shed on current investor concerns. As one might expect, policy regimes and policy choices really do matter during periods of major systemic stress. History warns us not to take it for granted that the Federal Reserve will succeed in normalizing rates in a straight line as the effects of price declines on economic activity tend to persist longer than expected. With regards to financial markets, in the first 7-8 years after such a crisis above-average returns for both bonds and stocks are likely as equities start at very cheap valuations and interest rates are falling. 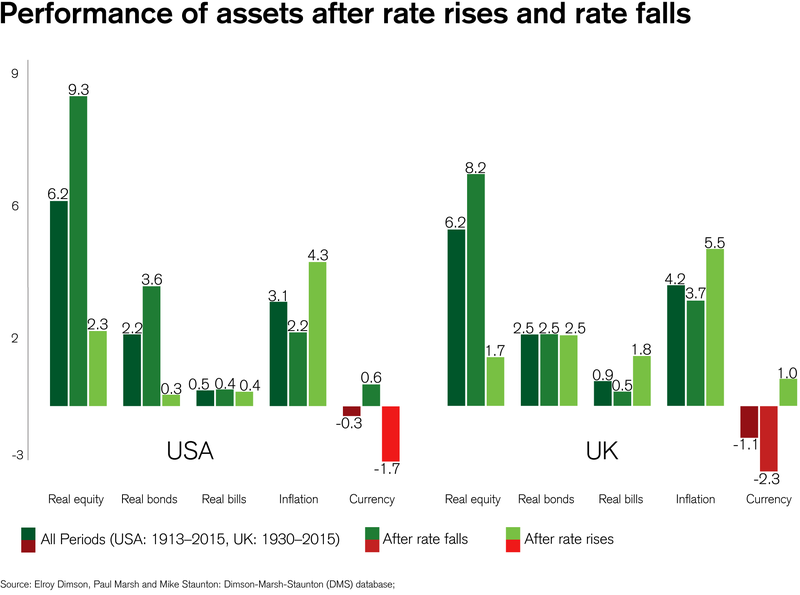 Over the following decade, however, the tendency is for bond and stock returns to be much lowerHistory suggests that the risk today of a 1937-style policy mistake is all too real, and that we should probably not expect a standard hiking cycle. During the recovery periods, moreover, systemic fragility tends to persist, meaning that bond yields actually trend down through the first 7-10 years of recovery, before a long secular bear market begins. Jonathan Wilmot, Managing Director of Credit Suisse, said: "Looking forward, we think zero real returns for developed market bonds and 4–6 percent for equities would be a good working assumption. That means real returns on a typical mixed portfolio of bonds and stocks will likely be 1–3 percent p.a., down from around 10 percent p.a. over the past seven years. That is bad news for retiring baby boomers and will pose a structural challenge for the fund management industry, as previously successful investment approaches struggle to meet investor needs"
Covering 26 markets, the Credit Suisse Global Investment Returns Sourcebook, also launched today, examines risk over the long run and the historical extremes of investment performance. It documents the global long-term and shorter-term rewards for equity and bond investing, and presents the detailed 116-year dataset that underpins the Yearbook. Is active Interest Rates: Does Hiking Damage Your Wealth?